I often talk about menu pricing and the power of three. It’s truly powerful stuff. It’s the fact that when faced with three options people tend to gravitate towards the middle option. And it works with pricing too. So you might only currently offer one package – your tax return package for example. By adding more services and creating two other packages you will find that many will choose to pay you more by going for the middle, and therefore more expensive, option rather than your basic package. But how do we get them to do that? This is evident by people’s use of Amazon – or any site that has customer reviews. Customers can see what their peers have bought and what they recommend and will often make their purchasing decisions based upon that. It’s the safe option and it makes social proof really, really powerful. You can help it along. When presenting your three options and you are describing the middle one mention the fact that it’s usually the most popular and that the majority of people choose that option. What you will find is that your customers will think that if other people are choosing that option then they probably should too. Pricing is marketing, so how you describe your packages is vital. Remember that you are trying to sell. You could choose three star, four star, five star to rate your menu pricing. Or you could go for something like bronze, silver, gold – the latter perhaps being a little more powerful. Don’t under estimate how important your choice of words can be. Another way could be describing the middle option as the full option. For example, when doing annual accounts you could have the cheapest option as an entry, or essentials account package. By default the middle package, the fuller package, now sounds more complete. It’s the better solution. Another powerful way to persuade customers to trade up is the tick box technique. In this you present your three options as a series of columns. Ticks and crosses mark the services that they do and don’t get with that package. It’s visual and powerful. So, if you want most people to go for the middle option think about the visual element – and balance the ticks and crosses accordingly.It doesn’t have to be that those extra features are that valuable in themselves. The power of the visual element – i.e. a column that has lots of ticks compared to an entry level option that might have only three or four ticks but lots of crosses – will be enough. 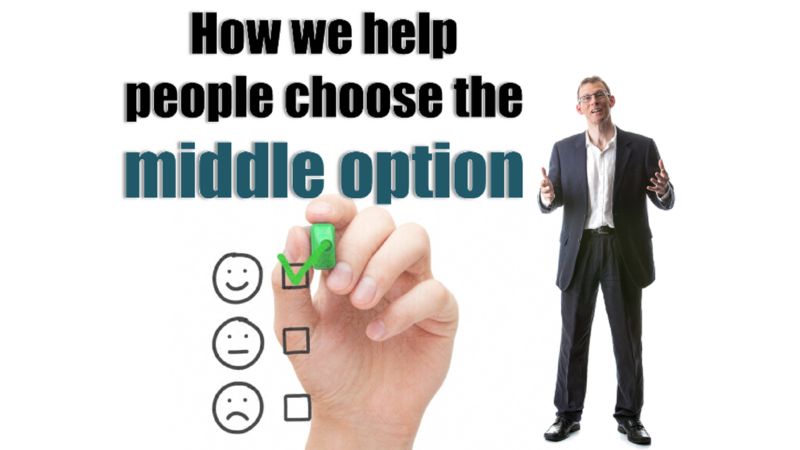 Find out how to help persuade your customers to choose the middle option by watching this video.